Graves Motorsports Sport Bike Swingarm Spools. The Graves Motorsports swingarm spool kits are available in 6mm and 8mm sizes and come hard anodized in your choice of colors. They are direct fitment motorcycle swingarm spool parts for bikes that have threaded spool bosses. Use the pull down menu to select your desired size and color of motorcycle stand spools. 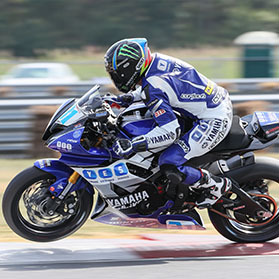 Yamaha models such as the R1 and R6 use 6mm sizing. Honda and Suzuki sport bikes use the 8mm sizing. Sold as a set (Pair of 2). Graves Motorsports suggests using the lightweight Graves Swingarm Stand with these spools! Bought these swingarm spools for my 2015 R3. The 6mm fit perfect. Items arrived in a small box. Product seems sturdy and has held up so far. I think the price for shipping was a little high, but my box arrived in a few days.